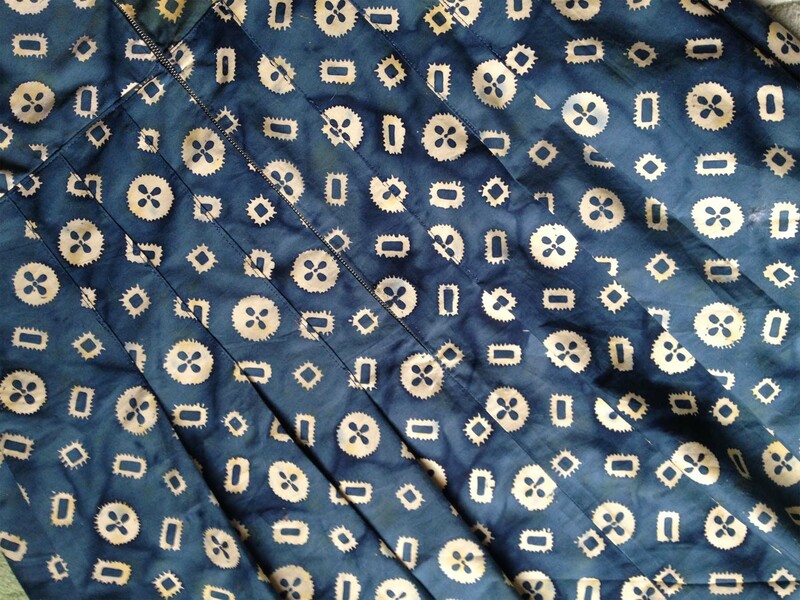 Rooting around in my fabric stash, I found that I had quite a surprisingly big piece of teal-blue batik fabric left over after making myself a skirt several years ago. 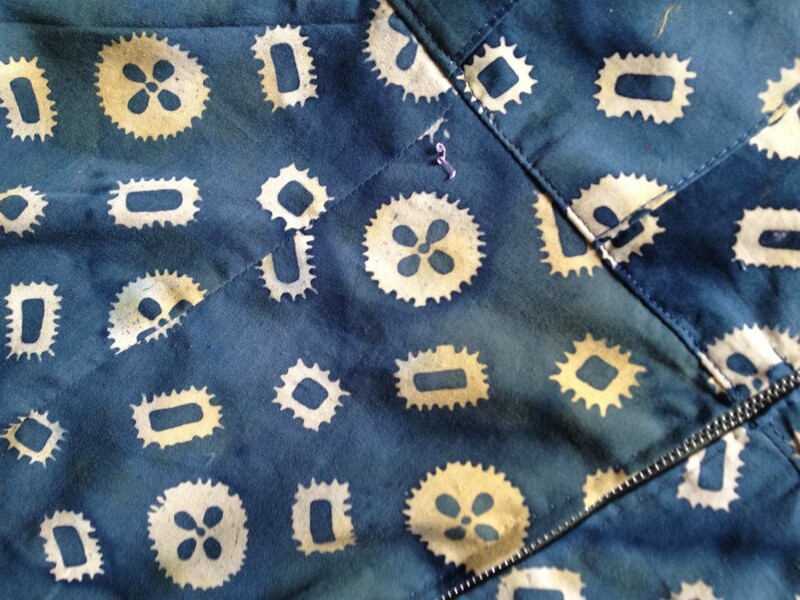 This is one of my favourite fabrics, and it came from one of the best fabric shops I know, Truro Fabrics. There are lots of things I like about this fabric – I find the simple geometric patterns and the streaks of colour change particularly pleasing. In places there are yellow streaks, as though I’ve spilt my coffee on the fabric – I just love these variegated shades! 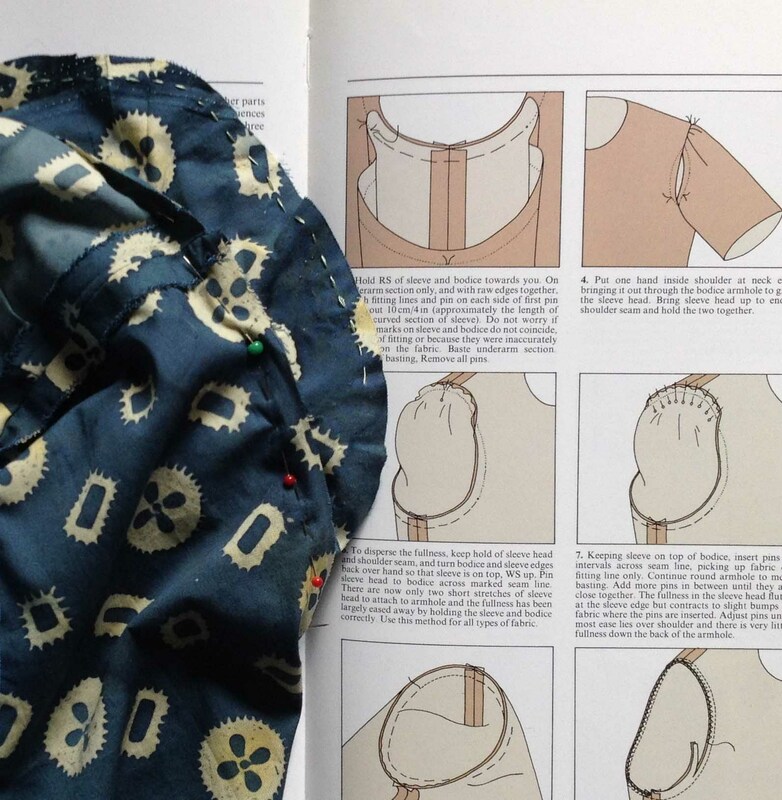 So I have the fabric – and I also have a pattern. This pattern belonged to my grandmother. She liked to wear very simple straight cut dresses. I don’t think the dress she was wearing below was cut from the pattern I’m using, but it’s very similar. 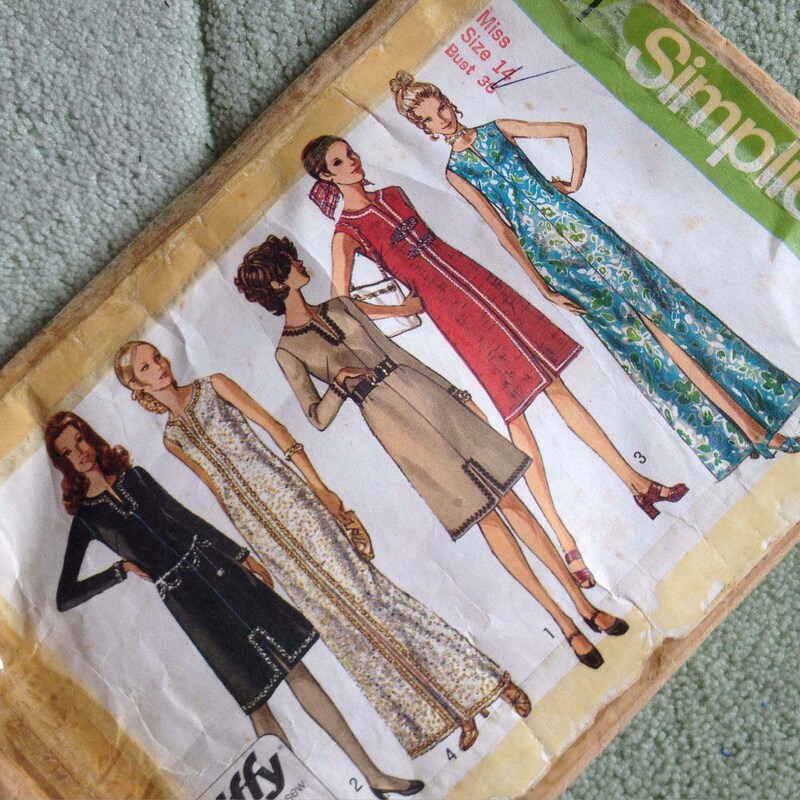 So I have fabric and a pattern – but the finished dress isn’t at all what you’d be expecting! First of all, I cut through the paper pattern at bodice level. 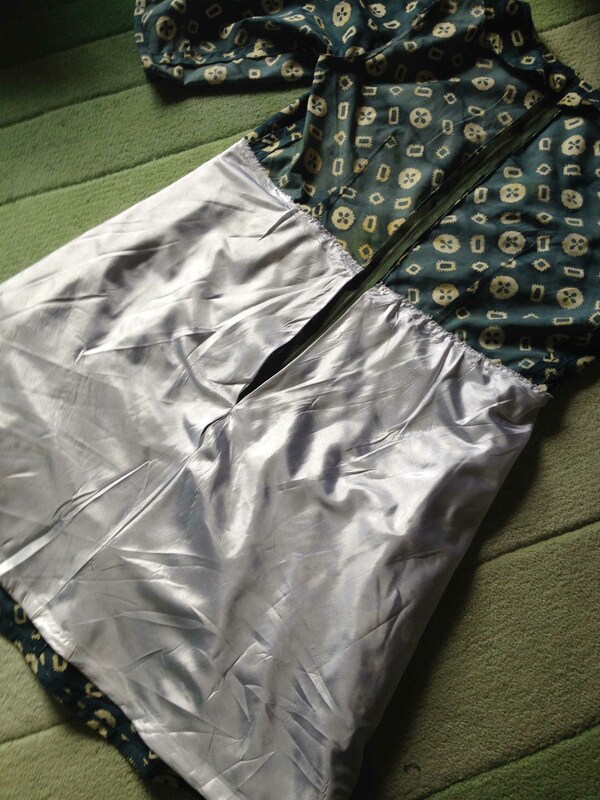 Then I cut a skirt nearly twice as wide as the existing skirt pattern, and I fitted it to the bodice with four pleats in the front and six on the back. 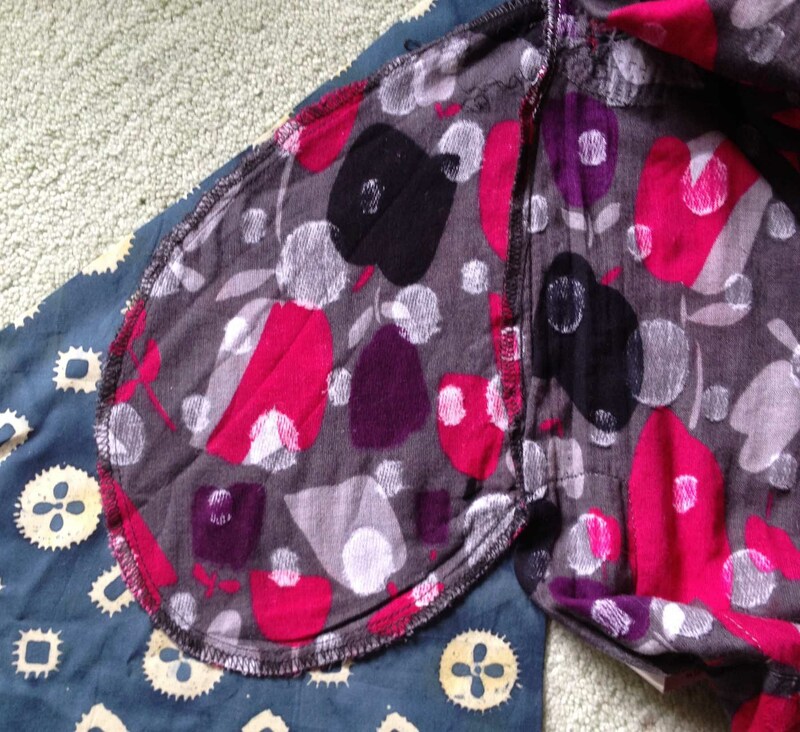 Stupidly, I cut the front bodice without thinking – (but as the pattern dictated) – in two pieces. Unfortunately, the central join looked stupid – the pattern just didn’t fit. 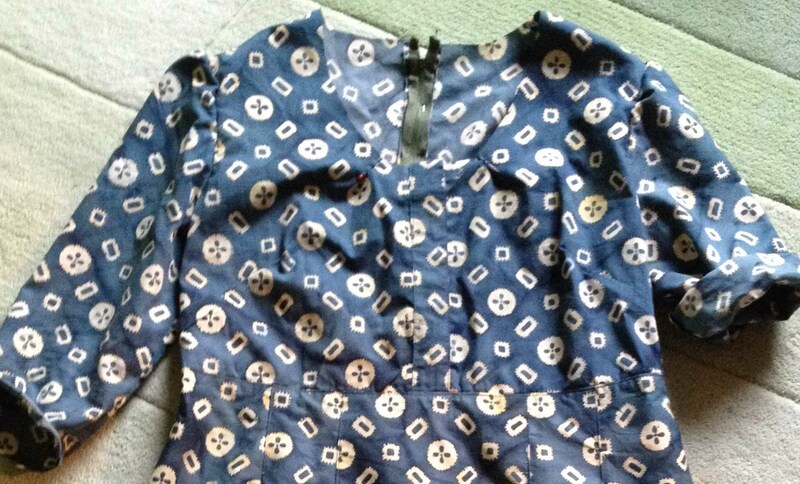 So I added a central placket to take the eye of the mismatched pattern. It looked a bit better. Now I’m toying with the sleeve lengths. I’m not sure whether to go for elbow length or shorter. And I don’t like the way the inset sleeves are puffy where they join the bodice – hmm, that doesn’t appear to happen on the original pattern. Out come my pattern-cutting guidebooks to help me work out how I can get the smooth inset sleeve that I like. Time now to play with the neckline! I’ve cut it right down from the original pattern as that was too tight round my throat. Would I like to add a collar? Small or large? 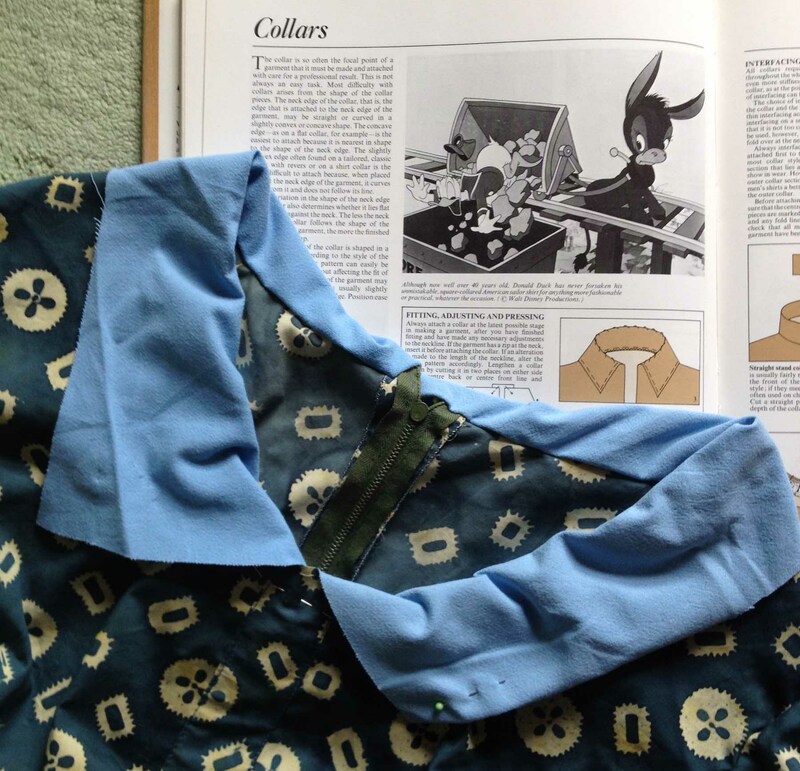 Or perhaps use some other fabric for the collar? I want to add pockets, but they’re not included in the pattern, so I have to get out another dress that has good pockets to use them as a template. I’ve decided to scrap the idea of adding a collar, but I can’t used the original facing that came with the paper pattern as I’ve cut the neckline down so low. The back of the dress is a bit “bustley” – it looks as though I’ve got a tail, or a bustle (as they wore in Edwardian times). So I’ve stitched down the skirt pleats at the back in a fan shape – the central pleat stitching is longer than the side pleat stitching. The only trouble with this fabric is that is stiff. I guess it is because of the residual wax from the batik printing. Consequently, the skirt doesn’t hang very softly. Luckily, I’ve got a lining left spare from a skirt I’ve taken to pieces for patchwork. 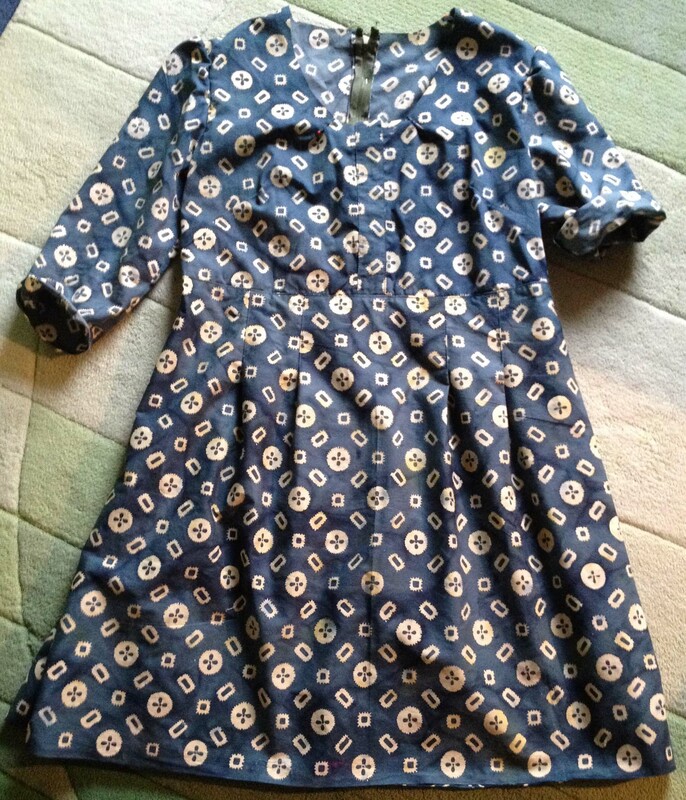 This lining is a soft rayon, and it’s cut on the cross. It fits perfectly! It doesn’t make the dress to swishy (I hate it when you can hear your skirt/dress lining swish as you walk along), but just adds to the soft hang of the whole. So here is the finished dress! Now to experiment with what I can wear with it!! Lovely vintage photo, brilliant dress! Thank you, Muse! I’m so happy with the result! Well, I have to say, you look great in that dress as opposed to the dress in different iterations !! Always tricky re doing things…ask me how I know 🙂 Guts woman, you got guts! 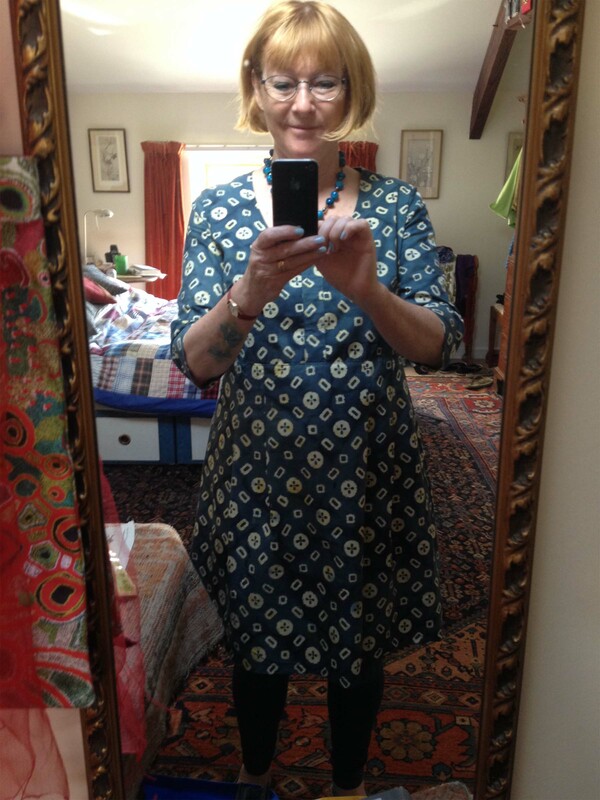 It did take a time to get things right with this dress, Susan – part of the fun, but also part of the challenge (I got very dispirited at times :-(( ) – whatever, I’m really pleased with the result! I do enjoy and approve of your sewing process! It is a great result and suits you very well. The cardie is perfect with it too. 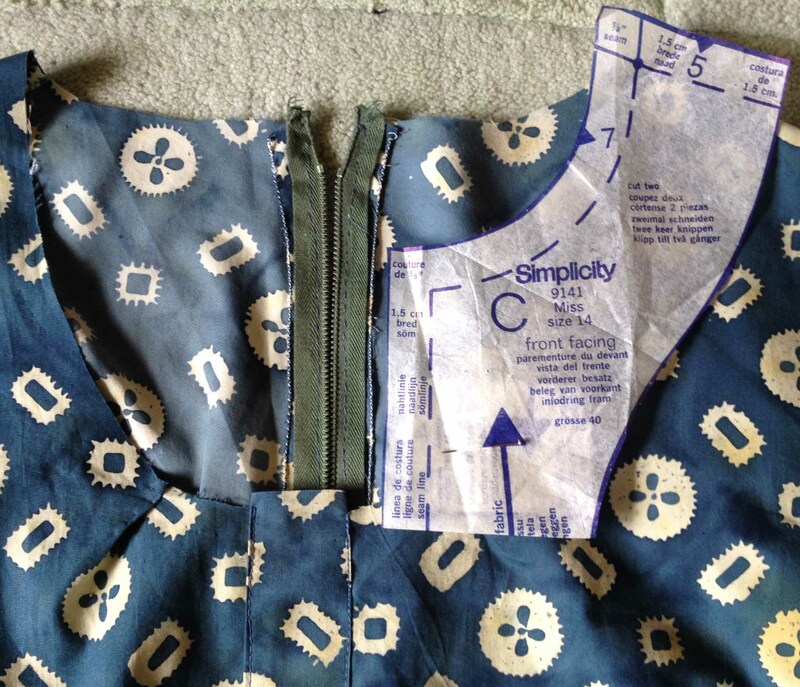 Style away, handy sewist! 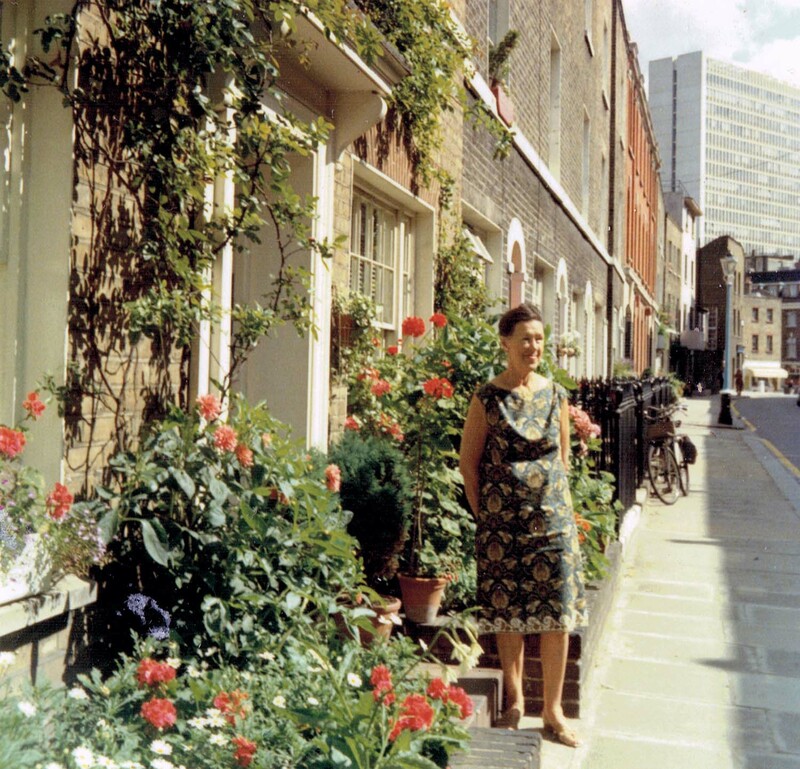 Thank you, Rebecca – it was the first dress I have made from start to finish for several years, and my approach was so different to what it used to be – so much more exploratory, and forgiving. 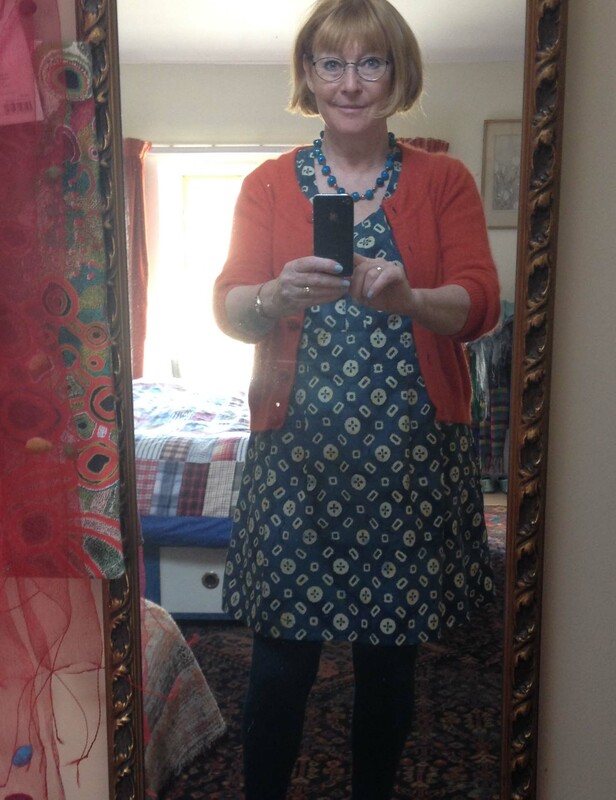 At the moment I’m having an orange “moment” – so pleased when it’s the right colour for what I want to wear! Wish I’d read this before coming, as I would have asked to see it modelled! By next time you will have made more gorgeous creations and we’ll both have forgotten about it. It’s fabric alchemy. Yes! – another thing I forgot to show/talk about when you were here! As you put it so well – it’s fabric alchemy.